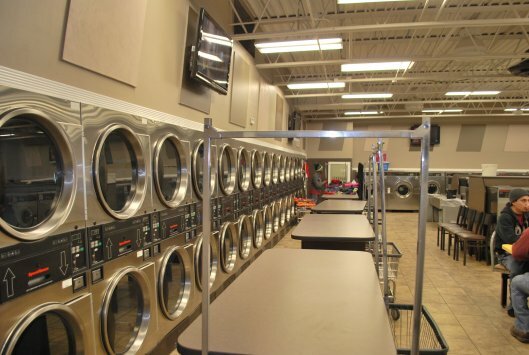 Laundry & Tan Connection is Indiana’s biggest coin laundromat, and we have recently begun expanding to new locations in Kentucky. Each of our stores is designed for maximum customer comfort and convenience. With machines of all sizes and capacities, our laundromats offer the perfect machine for your needs, whether you are washing one small load or all the clothes for a big family. Each of our stores offer plenty of space to spread out your clothes, while never feeling cramped. While doing your laundry, you can be entertained watching one of our many big-screen plasma TV's. Our stores are open seven days a week, from early morning until late at night, with some locations open 24/7 around the clock. At each of our stores, you can enjoy free, complimentary fresh coffee. Many of our locations also feature a clean, kid-friendly play land to help keep the youngsters occupied while you are doing your laundry. Best time to come for multiple open machines is Tuesday through Thursday at 7 am to 5 pm. Come experience for yourself why the Laundry & Tan Connection is everyone's favorite coin laundry!